This year Edith Duly Nursing Home celebrates its 50th anniversary. In the intervening years, we have grown from a modest 18 bed geriatric home to 75 beds offering not only general care, but full frail care administration. Accommodations are in 4 to 6 bed male/female wards, semi private or private rooms, with or without en suite bathrooms and three double units to accommodate couples. Full boarding facilities (laundry, meals, teas) are included in the fee structure as well as 24 hour nursing care and assistance. Arrangements can be made for residents accommodated in private rooms, who wish to have their own private nurse. Although originally intended as a geriatric home, at the discretion of the Board of Trustees, Edith Duly will consider under age persons who prove the need for nursing care or assistance. In late 1986, with the help of a number of well wishers and especially, the Lions Cub of Matopos, a Convalescent Unit was opened. 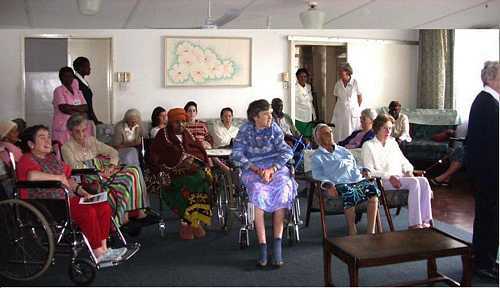 Patients are admitted to the Convalescent Unit, via their medical practitioner, for a period of up to one month. This interim assistance has proved invaluable for patients leaving hospital, but who are not yet ready to return home; and to families who have needed to reorganise their own home environment when a loved one has incurred a medical trauma. No institution such as ours could have survived the economic turmoil of the last few years without the outstanding generosity extended by the public and donors. This year we have been able to install solar geysers and lighting panels, make much needed repairs to the roofs and are thrilled at the imminent installation of an electric oven to assist our very old, though much loved AGA stove. We have also enjoyed the benefit of a state of the art computer with UPS and a wonderful industrial wet/dry vacuum cleaner. It is hoped that this year we will also be able to make the very much needed repairs to floors through-out. In addition to our regular donors who have been supplying up to 80% of our food requirements, we have received unwavering support from well-wishers in the form of staff uniforms, clothing, blankets and Christmas goody bags for residents. These donors are not only local, but many are from South Africa and Botswana. Another invaluable source of assistance has been The Morning Mirror. Advertising revenue generated has been passed on to us and we wish to take this opportunity to thank all those involved. The unsung heroes who voluntarily administrate the smooth collection of funds are cordially praised indeed!